Following Trump’s scandalous remarks at the UN, Venezuelan journalist Aram Aharonian assesses the likelihood of US military involvement in Venezuela. The persistent insistence of US President Donald Trump at the General Assembly of the United Nations when he stated that “all options are on the table” to solve the crisis in Venezuela has aroused alarm in political circles in Washington and throughout Latin America regarding potential US military action or, more probably, [action carried out] using Colombian or Brazilian troops. Alarms were turned on after [Colombian] Senator Iván Cepeda Castro warned of the rising military tension between Colombia and Venezuela. 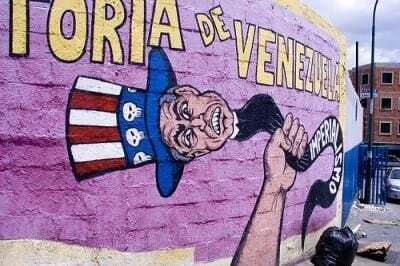 “The danger of war with Venezuela grows: the budget for anti-aircraft weapons, first-degree military cantonment, arrogant statements by US officials about ‘defending Colombia’ were meekly accepted by our government. We will have to mobilize against the war lunatics,” he said. Meanwhile, very well equipped Brazilian troops are parked in Roraima, the border state with Venezuela, waiting for an order to attack. [Brazilian] presidential elections and military involvement in them delay any decision on the matter, analyst Joaquim Fernandes says. US bases in Colombia, Central America and the Caribbean, are still on a state of alert. A question continues to gnaw analysts: what would happen the day after a hypothetical invasion? Who will rule the country? What will be the political cost that the US and its accomplices must pay? The opposition has failed, in 20 years, to present itself as an option for power, nor has it had a project which amounts to more than removing Nicolas Maduro’s government, as before they tried to do with Hugo Chavez. Despite the permanent and terrorist media bombardment, the international front which was forged against Venezuela seems to have stalled, perhaps because its fundamental purpose ─ the overthrow of Maduro ─ has failed. Destabilization and terrorism have not weakened either military or electoral support [for Maduro]. The only option remaining for the warmongering alliance seems to be an armed intervention, which would generate a widespread repudiation across the region. Does Washington have a card up its sleeve? The offensive against Venezuela is the number one topic. Through diplomatic channels [the US and its allies] achieved a majority in the Human Rights Council of the United Nations in Geneva, and five countries (Colombia, Peru, Paraguay, Argentina and Chile) joined Canada in demanding that the International Criminal Court (ICC) “investigate the possible commission of crimes against humanity in Venezuela.” [The ICC] always fails to take a look at what is happening in Mexico and Colombia, for example. Perhaps it is for this reason that the UN named a lady who does not believe in human rights and has no knowledge of the area, as High Commissioner for Human Rights at the UN. Former Chilean President Michelle Bachelet, who after violating human rights in her country with repression of any protest and in particular of the Mapuche people, involved in military and financial scandals and widespread corruption, began her work to add to the attack on Venezuela. Trump’s comments emerged after the reports of meetings of senior US officials and military with Venezuelan army officers who had joined plans to overthrow President Nicolas Maduro, as well as after suggestions by some regional presidents and diplomats that an invasion is being considered as an alternative. Many were surprised when he asked the FBI to come to Venezuela to investigate the [August terrorist drone] attack against him, forgetting the issue of sovereignty. The wear and tear, as well as the discrediting of the opposition, are linked to their refusal to dialogue, since this attitude led, inevitably, to a dead-end of arrogant radicalization without regard for legality, Rangel adds. Polls confirm that internally the government has breathing space, while at the same time confirming the weakness of the opposition and the depletion of their leadership and the lack of a political and economic project. Other analysts mention Maduro’s omission [at the UN] of the illegal operations of the transnational ExxonMobil in the territorial waters of the [disputed] Essequibo region of Guyana, and of the economic and financial embargo applied not only by the US but also by the Union European. The UN Assembly seemed to be the ideal setting for it. Yet, Maduro has denounced the aggression, the aggressor and their reasons, one of which is because Venezuela is the country with largest certified oil reserves in the world, and “it is certifying the largest reserve of gold in the world and the fourth reserve of gas on the planet,” he says. For critics of the President, Maduro is trying to distract away from the handing over of natural resources (gold, oil and gas), and the privatization and sale by parts of the state oil company PDVSA, leaving the primary activities, which are constitutionally reserved to the state, in the hands of friendly companies. There is frustration in the face of the postponement of a rapid military action among warmongering US leaders, who say that it would put an end to the Bolivarian Revolution, which they have been unsuccessfully trying to do for nearly two decades. Luis Almagro, secretary general of the Organisation of American States (OAS), continues to recite that one must not rule out any option “to reduce the suffering of Venezuela.” Numerous officials of the new Colombian government of ultra-conservative Iván Duque coincide with this view. This time, though, in light of the interventionist spiral launched from Washington, 12 countries rapidly issued a statement rejecting the use of force. For some analysts, the exploration of non-peaceful means better reflects the frustration felt about the prospects of a peaceful democratic transition in Venezuela, faced with the reality of a dismembered political opposition which has shown itself to be incapable, ineffective and without ideas despite the enormous funding received from Washington, Bogota and Madrid. US State Department officials have come to the conclusion that more sanctions or further diplomatic isolation for Venezuela will not mean a political transition, due to the absence of real domestic pressure on the government. The protests over the shortages of food, medicines, water and electricity have been limited to daily outbreaks, small-scale, and scattered regionally, which the opposition has failed to exploit. In any case, the USA, Canada, the European Union, and South American countries aligned to Washington in the Lima Group have intensified diplomatic, media and economic pressure (limited credit, preventing financial transactions) on Maduro and Venezuela, but many of them are still waiting for the rebirth of gunship or military coup diplomacy backed by the United States. The USA, Canada and European countries even froze the assets of dozens of senior military and civilian Venezuelans, while some Latin American governments have denounced the government for its “authoritarian practices” and the “humanitarian crisis,” asking that Venezuela be suspended from the OAS. 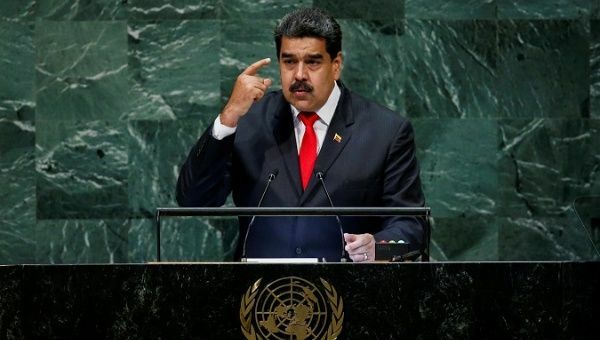 In recent days, Canada and five Latin American countries urged the International Criminal Court to investigate alleged crimes against humanity committed by the Venezuelan authorities, and the interventionist U.S. Senators Bob Menéndez and Marco Rubio presented a draft law to encourage US and regional pressure on the Venezuelan government, which failed to even create fissures within the government [in Caracas]. The oil embargo [which was rumored leading up to the UN General Assembly] didn’t make it beyond the inkwell on Trump’s desk. Oil represents 90% of the few exports from Venezuela, which is dramatically reducing its production. So the question does not lose validity: what would happen the day after an invasion? Who will rule the country? Perhaps Luis Almagro will put himself forward as viceroy? A Hinterlaces poll revealed that more than 64% of Venezuelans have an unfavorable opinion about the actions of rightwing leaders: 83% looked unfavorably upon Julio Borges, leader of the First Justice (PJ). Henry Ramos Allup, secretary general of Democratic Action (AD) rounded up 77% negative opinions, while Henrique Capriles Radonski is perceived negatively by 76% of those polled. For his part, Henri Falcon, former presidential candidate and founder of the unitary platform, the Coordination Network for Change, has 73% negative opinions, Leopoldo López has 75% negative perception, and Maria Corina Machado, founder of the party Vente Venezuela, has 64% collective repudiation. So, entering the stage of speculation. Would Brazil, Chile, Argentina, Peru, Panama, including Colombia with their enduring internal problems and the strength of the opposition sectors and the weaknesses of their governments, remain united behind the aggression, or would they fear that the stability of their own governments would be threatened? I do not think that the new government of Mexico would support a [military] intervention, nor the OAS despite the hysterical desperation of Almagro. However, it is clear that the US hawks may push for intervention: we must not let our guard down.